Entry is free for the child below 3 years. Entry fee for the year 2017 was 4.250 Kuwaiti Dinar. But authorities have increased the Aqua Park Kuwait ticket price for the year 2018. Now you have to pay 4.750 Kuwaiti Dinar as an entry fee. Food and beverages are not included in this ticket price. Rates are higher from outside for these items. So we suggest you keep at least water bottle with you. For Kuwait Aqua Park entry fees promotional offers click here. Aqua Park Kuwait timings are different for the period of Ramadan. Public holidays and festival season may affect the timings. The water park remains open during summers (April to October). Apart from water park rides, if you want to enjoy Go karting or paintball then you can visit this park all over the year. Family Day: Friday will be a family day. Women Day: Thursday is reserved for ladies only. Men are not allowed on Thursday. Note: Try to avoid visiting during weekends. As this water park is too much crowded on the weekends. Address: Arabian Gulf Street, Kuwait City 15400, Kuwait. 1. Visitors need to wear descent Nylon or polyester clothes. 2. Provocative swimwears like Two pieces bikini, Thongs, Shorts, Cutoffs, Tee Shirts are not allowed. 3. Cotton cloths, Types of Denim are not allowed. 4. Any kind of Metal types of equipment like belts, watches, bangles are not allowed. This amusement park is for all age people. There is Kiddy pool for children below 8 years. If you want to relax in the water then just take a tube and float in the lazy river. There are total 14 rides available in the adventures area of the park. Thrilling rides like Octopus slide and floating toadstools are attracting youngsters. You can also enjoy other water sports activities like Scuba Diving which are generally not available in water parks. Apart from this, some other attractions are Go Karting, Aloha Lagoon, Beach Football, Large Family Swimming Pool, Beach Volleyball, Paintball, Soat Football etc. For the 13 to 31 age group, people there are some breathtaking activities like a 20-meter high slide, double backslash, huge wave pool, waterfalls etc. There is different changing rooms and Mosques for men and women. Food courts are also available inside the park where you can taste the intercontinental, fast food, barbeque etc. Ice cream parlors are also present for ice cream lovers. Food and beverages are a little bit costly inside the park. 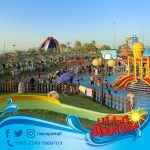 How To Reach Aqua Park Kuwait? By Road: Kuwait public transport bus services provide the most affordable traveling in Kuwait. If you are traveling by road then you should try their public bus transport. You need to walk for 10 minutes from bus stop to the water park. Private taxi service is another good option for visitors. Kuwait taxi service is reliable, safe and affordable.